The Old course at St Andrews is the most famous stretch of golf links in the world. It is the historical and cultural home of the sport and the Mecca to which every golfer wants to make a pilgrimage at least once. With the notable exception of Ben Hogan, all the great names in the game have walked across the famous little stone bridge over the Swilcan Burn onto the final fairway. Before them is the most famous view in golf, the Royal & Ancient clubhouse guarding the expanse of fairway that is shared by the first and last holes. It is possible to follow in their footsteps, but the privilege comes at a price. To play the 18 holes in the summer of 2009 will cost £130. Golf has been played on the Old course for more than 400 years and it has evolved over the centuries at the whim of time and tide. The course is unique in that its design and layout owes little to the hand of man. Rather it is a masterpiece that stands on a strip of land jutting into the Eden Estuary as a tribute to the shaping power of nature. The sea is seldom in view, but the Old course is the classic seaside links with its undulating fairways and massive double greens. In fact, there are only four single greens on the Old course – at the 1st, 9th, 17th and 18th holes. There are only two short holes – the 8th and the 11th – and both are contained within the Loop, a run of holes starting at the 7th and finishing at the 11th where the fairways of these two holes cross. The key to survival round the Old course is avoiding the dozens of bunkers. Most are hidden from view and many of the traps have interesting names. Perhaps the most famous is Hell bunker, a vast pit of sand 100 yards from the 14th green. The massive Cockle bunker is in front of the 7th green and Strath bunker eats into the front of the 11th. Three bunkers in the centre of the 16th fairway are known as the Principal’s Nose, and then there is the notorious Road bunker on the 17th. Many of the names given to holes are self explanatory, such as Short, Long, Burn and Dyke, but others are more intriguing. For example, Ginger Beer, the 4th hole, takes its name from a ginger beer stall run there by David Anderson, known as Old Da’, during the nineteenth century. Perhaps the most famous hole is the 17th, known as the Road hole. The road behind the green has claimed its share of victims, including Tom Watson in the 1984 Open Championship. Those desperate to avoid the road must also beware the Road bunker, which eats into the front of the green. Tommy Nakajima was well placed in the 1978 Open Championship until he found this bunker and took four shots to get out. 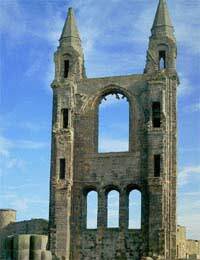 St Andrews is also the home of the Royal & Ancient Golf Club, the governing body of golf throughout the world with the exception of the United States and Mexico. Contrary to popular belief, the R&A does not own the Old course. The course is held in trust by the local authority under an Act of Parliament and this ensures that the course remains, as it has always been, a municipal links open to anyone to play upon payment of a green fee.